Top » Catalog » Modifications » Do It Yourself » NCC0514_LED Bookmark Us! 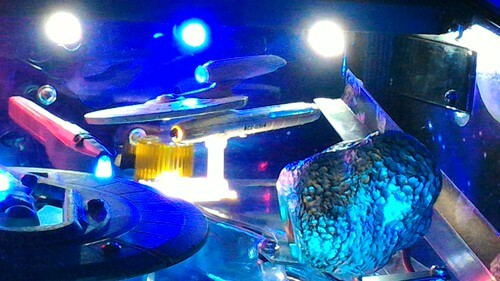 This set of Printed-circuit Board Assemblies (PBA) come assembled with battery holder circuit board to power the Hallmark USS Kelvin's (NCC-0514) internal ship lights along with three natural white stadium lights attached to the base board for final installation in a Stern Star Trek Pinball Machine. These stadium lights shine up thru the included mounting bracket to bath the ship in a nice glow. The stadium lights come with a brightness variable resistor which controls the brightness independent of the ship lights. Includes a voltage regulator and resistor to ensure your Kelvin operates for years in the machine. This mod is our take on the popular USS Kelvin mod originally documented by BillE on Pinside. This DIY kit is what I would call intermediate. It will probably take several hours to complete this mod - as it will require separation of the saucer to install wires to the battery compartment. For more information on these kits or for general help; please visit the Pinside Thread. or our Blog. Notify me when "USS Kelvin StadiumLEDs" is re-stocked.